Provide comfort for the family of John Jarvis with a meaningful gesture of sympathy. John Jarvis passed away peacefully at the Kirkland Lake and District Hospital after a long illness on Jan. 6, 2019, at the age of 77. 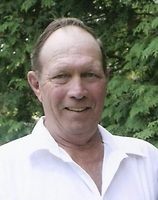 Left to mourn are his wife of 54 years, Sharon (née Morden), his children Wayne (Kim), Brian (Kent Forrester, Micheal Krupar), Irene (Ted Lockrey), Donna (Allan Huisman), Terri (Glenn Welsh), and Angela (Jeremy Grisdale), his grandchildren Daniel Lockrey, Kaylee Grisdale, Ashley Lockrey, and Anna Grisdale. Also mourning are John's mother-in-law Shirley (Lloyd, predeceased) Morden, sister-in-law Kathryn (Clayton) Morden-Dumoulin, brother-in-law Craig Morden, and many nieces and nephews. John was pre-deceased by his parents, Arthur and Josephine (née Pearson), siblings and their spouses: Ruth (Frank Baxter), Walt (Elsie), Jean (Bob Laidlaw), Gladys (Bob Kyle), Mary (Bob Perry), and Joe Jarvis. John was survived by his brother Hugh Jarvis, and his sisters-in-law Georgina (Hugh) Jarvis and Pat (Joe) Jarvis. John was a retiring man, more at home in his fields than at a party. An excavator operator for many decades, he could turn a clumsy machine into a graceful instrument. As an active volunteer at the Rod Inglis Memorial Steam Show, John could be found winning the slow tractor race with his John Deere 820 every time. He loved few things more than tinkering with any machine, broken or not, and generally applying his unorthodox & mischievous creativity and sense of humour. A celebration of life service will be held in the late spring and subsequent burial will take place at the Brentha Cemetery in Dack Township. In lieu of flowers, in memory contributions to Crohn's & Colitis Canada or The Canadian Lung Association will be greatly appreciated. To send flowers in memory of John Jarvis, please visit our Heartfelt Sympathies Store. Provide comfort for the family of John Jarvis by sending flowers. Sharon and family Please accept my deepest condolence on the loss of John. Sharon and family we are very sorry for your loss. Our thoughts are with you. Dear Sharon, Our deepest sympathies to you and your family. We are so sorry for your loss. Dear Sharon & Family: Sharon, may the love and support of your church family and the community give you strength through this very difficult time. Your never ending love and support to John made his passing so peaceful. Bless you!